Fiber optic submarine cable networks have become a critical infrastructure to meet today’s insatiable demand for bandwidth and hyperconnectivity. It’s easy to imagine all the world’s data zooming around above us between satellites in space, but in fact 99%[i] of international data traffic is ripping across the ocean floor! With submarine cable networks in charge of carrying most of the world’s digital communications, failure is not an option. Those in the subsea business know how crucial it is to be able to test and monitor subsea network quality—particularly with solutions that can operate remotely. We interviewed our expert Jean-Sébastien Tassé, Product Line Manager in EXFO’s Optical Business unit, to learn more about these networks, and why testing them is so important. Q: Can you give us an idea of the scale of submarine cable networks worldwide? A: According to TeleGeography there are approximately 1.2 million kilometers of fiber optic subsea cables currently in service worldwide. These cables carry over 99% of intercontinental data traffic[i]. In effect, they are responsible for worldwide connectivity, international communications and a little something called the internet. Q: Who are the major players in this space? Typically, subsea cables are built and owned by consortiums—partnerships between communications service providers or private enterprises—but in recent years, more and more webscale companies, like Facebook, Google and Amazon, have been building and investing in new cable because they see the value in owning and controlling their own subsea cables to exchange data between their data centers scattered around the world. Q: How do undersea cables work? A: Submarine cables are made up of two key components: optical fibers that carry the data and a conductive material that transmits the current used to feed the optical amplifiers located along the subsea cable. Additionally, cables are coated with several layers of protective materials to guard and protect them against water and corrosion. 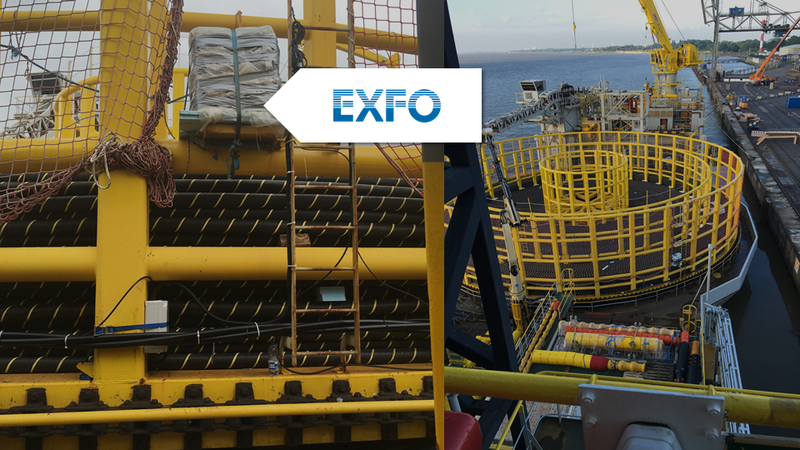 Equipment on ship photo: EXFO’s NQMSfiber solution remotely monitors fiber quality during the rollout of submarine cables. Q: How is testing submarine networks different from testing terrestrial ones? A: First, we should highlight that the reliability requirements of terrestrial and subsea cables are vastly different. Subsea cables are always designed for an expected lifetime of 25 years, with high margins of safety for all components. Terrestrial cable requirements are a lot less stringent. Both terrestrial and submarine networks use similar technologies, like optical fibers and erbium-doped fiber amplifiers, but laying new submarine cable networks is several times more expensive and lengthier than terrestrial deployments. Troubleshooting, repairing and upgrading them is likewise complex and costly–operating a cable ship runs in the hundreds of thousands of dollars per day. Subsea network reliability becomes critical when you know that fixing faults can take weeks. This is due to the limited number of properly equipped ships worldwide, the time it takes to reach the fault location by sea, among others. In contrast, terrestrial networks can often be repaired in a matter of hours or days. As the fundamental infrastructure for global telecommunications, subsea networks typically carry more data than terrestrial fibers. Monitoring and testing those fibers is vital—and monitoring them remotely is key too. What’s more, with the ever-increasing demand for bandwidth, preventing outages and ensuring reliability, performance and bandwidth availability is paramount for those in this business. Q: What kind of damage are submarine cables prone to? Typically cable cuts. Around 150 to 200 cables faults are detected every year worldwide. [iii] External causes like fishing, anchors and environmental factors (landslides, earthquakes, etc.) account for over 90% of those faults. Most of the damage occurs in shallow waters, close to the shore. Q: What are key testing considerations for operators deploying subsea networks? How can EXFO help? A: When it comes to subsea networks, several key parameters need to be tested, including attenuation, connector cleanliness, dispersion, optical signal to noise ratio (OSNR), throughput, latency and bit error rate. The transport tests should be performed according Y.1564 and RFC 6349 standards. EXFO provides comprehensive solutions for all phases of the network lifecycle, from construction, installation, maintenance and troubleshooting to top-quality service delivery. We are experts in optical testing, transport testing and fiber monitoring. Over 80% of new submarine cables deployed in the last 12 months were—and continue to be—tested using EXFO solutions. [iv] Most of the tests are performed at the commissioning stage, but continuous fiber monitoring is becoming more and more popular, as it helps reduce cable faults. Regular maintenance tests are also carried out from the cable landings stations. Q: Are submarine networks here to stay? What is the future of submarine networks when you consider today’s changing infrastructure and developments like 5G? A: Yes. There is no competitive technology on the market for intercontinental communications. Data rates keep increasing—we’re at 100G and 200G now, while 400G is close behind—and 5G will bring even more intercontinental traffic, which will require even more subsea cables. Submarine networks are definitely here to stay and so is EXFO—it’s our business to make sure they work! To find out more about, visit https://www.exfo.com/en/solutions/communication-service-providers/wireline/submarine-networks. [iii] Maurice E. Kordahi et al. for the Submarine Cable Improvement Group, “Global Trends in Submarine Cable System Faults,” Suboptic (2016), Suboptic.org.